The 05022721001 Wera 3950 PKL 9 Piece Set, Metric, Stainless is one of thousands of quality tooling products available from MRO Tools. 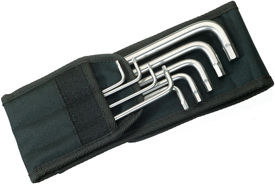 Please browse Wera Hex Plus PKL L-Keys for tools similar to the 05022721001 Wera 3950 PKL 9 Piece Set, Metric, Stainless. 05022721001 Wera 3950 PKL 9 Piece Set, Metric, Stainless description summary: Wera 3950 PKL/9 L-key set, imperial, stainless. 3950 PKL: 1 x 3/32''x112; 1 x 7/64''x119; 1 x 1/8''x123; 1 x 9/64''x130; 1 x 5/32''x137;1 x 3/16''x154; 1 x 1/4''x185; 1 x 5/16''x195; 1 x 3/8''x224 Quantity discounts may be available for the 05022721001 Wera 3950 PKL 9 Piece Set, Metric, Stainless. Please contact MRO Tools for details.